Every year on the 13th October is Penguin Awareness Day, where we celebrate and support our penguins by raising awareness of their endangerment and how we can prevent these horrific occurrences from happening. Some do the ‘Waddle’, a short walk with a group of people and others, like myself, go to enjoy the splendid sight of watching rescued African Penguins being released at the Simons Town Penguin Festival. 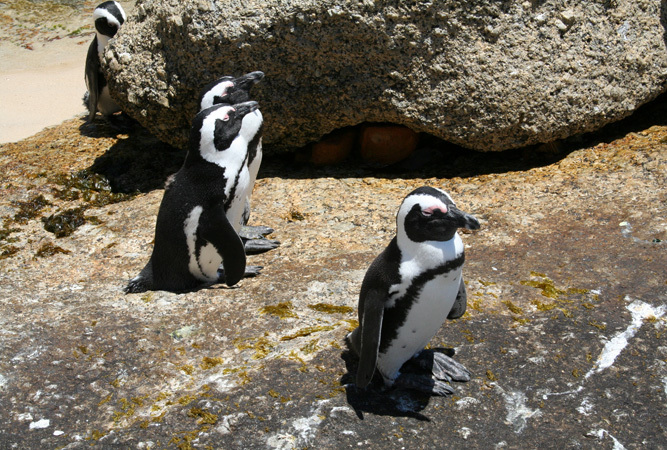 In Simons Town, Cape Town, the annual penguin release is held at Seaforth beach. I got to the beach really early and found a great spot where I could watch the penguins, who have been rescued and looked after by SANCCOB (An organisation who primarily save African Penguins and other threatened seabirds), finally released back into their natural habitat after the terrible ordeals they had experienced. Waiting patiently in the sunshine, I caught the first glimpse of boxes being brought onto the beach. As they were lined up in a semi circle facing the water, the crowds started drawing nearer. When the boxes were ready, SANCCOB staff made a short speech and then the action began. Rows of children were standing behind the boxes and once the tops were open they had the opportunity to push the boxes over gently to let out the very excited and disorientated penguins. They immediately flocked together and waddled down the beach towards the water. The crowd was silent watching this very rare and emotional experience. As soon as they got into the water they started heading out, but then turned and came back to the shore as they somehow realised that there was one penguin not quite in the water yet. Staying in a group they waited for the stray penguin to join them and then once more set out on their journey. 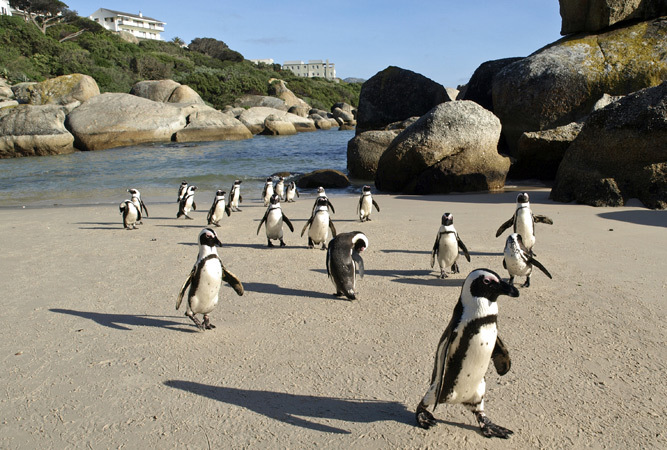 They swim out from Seaforth beach and make their way around towards the safety and comfort of Boulders beach. Once the penguins were out of sight, I started my walk along the boardwalk passing the boulders beach nature reserve, where many African Penguins can be seen nestling under the trees. The views of the beach are stunning from the boardwalk and it is definitely worth taking a stroll along there. When I finally reached the end of the boardwalk there were various stalls to look at, a penguin puppet show for the kids and SANCCOB and Save Our Sharks stalls to get fantastic items from to support and raise awareness for those who cannot do it themselves. There was also the opportunity to meet with and speak to people from the centres to learn more about what they do and how we can help. You can go into the Boulders Beach Nature Reserve for a minimal fee and swim with the penguins, which is truly an exhilarating experience for both children and adults. Whether you are an animal lover, a tourist wanting a unique experience or a family looking for something fun and different to do, The Penguin release is definitely a must.